A lot of consumers used the word ‘comfortable’ to describe the Puma Ignite v2 and their time wearing it. This running shoe’s colorful upper unit was lauded by testers who stated that they made the façade very eye-catching. The flexibility of the platform gained praise because it allowed the runners to move their feet more naturally. The underfoot cushioning system was reliable, according to many testers. Several testers reported that the platform was capable of absorbing impact shock during the landing phase of the gait cycle. The price was affordable, according to runners. Some consumers were able to use this running shoe for a variety of activities, and they said that it didn’t disappoint them in any way. The runners reported that it was true-to-size. 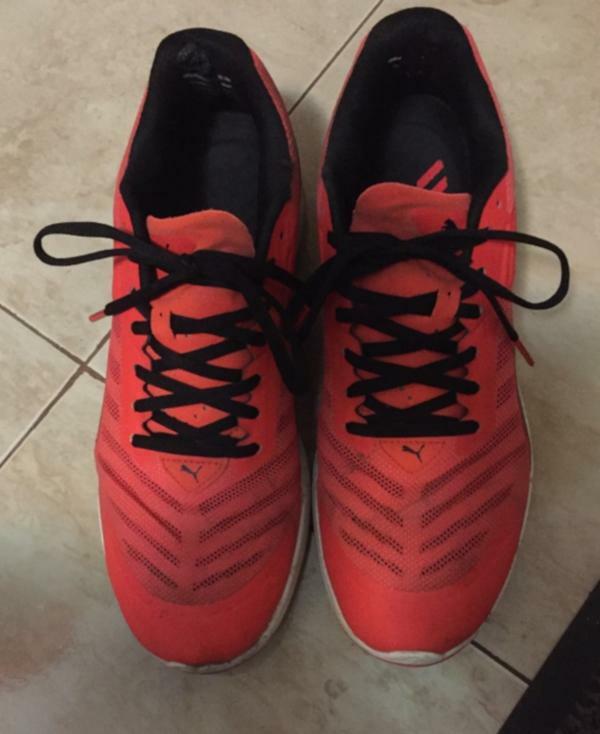 Some runners complained that the Puma Ignite v2 was too narrow for their feet. A few runners were disappointed with the shoe’s thin tongue because it didn’t feel comfortable against their skin. The Puma Ignite v2 gained positive feedback from many reviewers because of its impressive cushioning and the responsiveness of its components. A lot of them wrote that its mechanisms were durable, and that it was generally comfortable. This road shoe became highly recommended for those who need a reliable running companion. I bought the Puma Ignite v2 10 months back. First of all, I would like to thank the RunRepeat community for helping me out to find this awesome pair of running shoes at a very good price. I started running after having had serious spinal problems to increase my core strength and stability. By that time I weighed almost 90kgs and as per the advice from my Orthopedician, to use running shoes with very high cushioning, I found the Ignite v2 to be the best fit for my budget. The color options provided by Puma are so easy on the eyes and appeal to varied tastes. The upper layer of the Ignite v2 is made up of a highly breathable, porous mesh unit with vents at the top and both the sides. A sock lining layer is provided inside the mesh unit and so the shoes can be worn without socks as well. It is very breathable which helps in keeping the feet really dry even after very long time usage in hot weather conditions. A perfect selection of the upper material and the insole unit keeps the shoe odor free even after a series of consecutive days of wearing. Reflectors are provided on both the sides and also at the back of the heel-box as a safety measure for night time running. The tongue is thin and made of suede leather (maybe, feels like suede leather). It has flat style laces with small knurling like pattern to keep them stay put. In the whole period only twice the laces come untied during the run. Flat style laces with small knurling like pattern to keep them stay put. In the whole period only twice the laces come untied during the run. Special silicone prints are provided inside the heel box to prevent slippage of the shoes. The Midsole unit is made up of high quality IGNITE foam from Puma which is very responsive and springy. The groove like structures "Chevron flex grooves" increases the energy return from each stride. There are no signs of shrinkage or wrinkles on the mid sole instead small pores started appearing. The cushioning and the ride quality of the Ignite v2 are exceptional. I have run almost 700kms on this pair and even today the cushioning feels like the very first day of use. There is only a little drop in the amount of cushioning even after clocking such high mileage. The 30mm heel height of the Ignite v2 lets me feel as if I am stepping on something really soft and cushiony. The 12 mm heel-toe drop helps for a smooth transition of the foot from the heel through the midfoot to the toe. 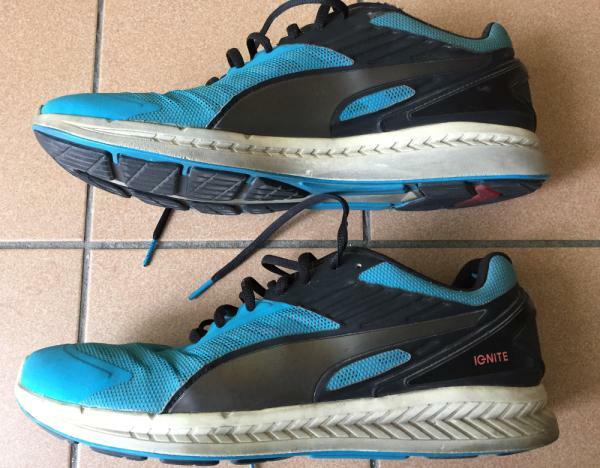 I have run few long distance (21k) training runs on the Ignite v2 to date, the level of cushioning and comfort was really good until the very end of the course. This is a great choice for people with high arches, joint issues, and heavier runners. The traction of the Ignite v2 is a monster in both wet and dry conditions. I had run on the Nike Dual Fusion X 2 on wet pavements a couple of times before buying the Ignite v2. Because of lack of traction, I started to think that running is a sport meant to be practiced only during dry weather. With the Ignite v2, I felt no drop in the level of traction with varying conditions of the pavement. The durability is what I like the most in the Ignite v2. I have run a number of 5k, 10k races on asphalt and a few 5k races on soft trails yet there isn't a lot of wear and tear on the outsole. Puma delivers great durability with its promising EVERTRACK technology outsole unit which is highly resistant towards abrasion. After heavy usage, the wear pattern shows my tendency to supinate and heel strike. There are signs of mild wear and tear all over the upper unit. The inner sock liner is also torn at the toe box. Just at the widest point of the shoe, there is a small hole showing up recently. Apart from these, the shoes feel great as usual. For sure the Ignite v2's are going to last easily somewhere between 700-800 km. The fit is what I dislike the most in the Ignite v2. These shoes run really narrow and it was really frustrating at the beginning until the shoes were broken in. Being a runner with wide feet, the tip and the toe box design are the most unlikely things about this pair. I wish Puma considers this issue and provides wider options in the future. At the beginning of this year, I was searching for a pair of shoes for my easy and long runs. The Puma Ignite v2 was able to meet the expectations. They were not expensive; it has a lot of cushioning and came in a wide variety of colors. After running more than 500km, they are still in good shape. Though the upper side of the shoes has breathable and comfortable mesh to keep your feet cool and dry, the shoes are not very breathable. The sweat does not evaporate adequately, and it is retained in the inside material, giving the shoes an unpleasant smell. At the heel area, the shoe created the notable silicon print to bring the additional security to rear section relating to the foot. As it locks your heel down right in place, these shoes can keep your whole feet for most of the times. The material in the heel area is not very resistant. It has worn out in time. The tongue which is comfortable and soft to our skin is not my favorite part of the shoes. During running, it may fold or slip to the shoe sides, becoming uncomfortable. Equipped with foam material, it offers the energy return and cushioning while being flexible and durable. The foam was placed conveniently in the heel area. This foam with high quality offers extremely durable cushioning which does not quickly lose the structural integrity or break down. Therefore, it may handle your weight while retaining a sufficient strength level after many times of uses. The outsole layer named EverTrack acts as the shield against abrasion and ordinary wear. Though the durable material was placed in the crucial areas of the shoe to prevent the degeneration, signs of worn out appeared in some spots. It provides you with adequate support and traction. I have run with them on various surface types, and they are very stable. It's slippery on wet and sandy ground. The shoes are true-to-size but a little narrow to the feet. The seamless and flexible mesh hugs your foot, yet opens an adequate space around your toe box. So, there is sufficient room for the toes to move and hang out. The Puma Ignite v2 is made of the superior material for cushioning. It disperses impact while offering the optimal responsiveness. The unique foam formula of the shoe provides you fantastic comfort and high rebound. Furthermore, its foam is integrated right in your heel to offer the durability for its long-lasting usage and performance. For the weight, all hypes relating to this super-fast shoe made me believe of its lightweight. But they are definitely not light! They are much heavier than all my other running shoes, weighing approx. 280g. They are not suited for speed training. Light and responsive, they’re excellent value for money, and their springy sole will make you feel like you’re running that little bit faster. The upper unit of the Ignite v2 has been updated with a more open construction. Most of the overlay system has been relegated to the side of the shoe, therefore providing more space for the breathable material to actually expose itself and encourage air to enter the shoe. A silicone print at the heel section of the shoe locks the foot down, thus preventing accidental slips and shoe-removals. Chevron Grooves in the mid-sole act as a rebound mechanism as they compress during impact and they spring back to their original state during take-off. It’s a solid way to propel the runner forward. The sock liner atop the mid-sole unit has been molded to follow the contours of the arch, hugging it and cradling it for additional support. The sizing scheme of the Puma Ignite v2 is regular. Runners can choose the size that they’re more acclimated to and be satisfied with it. The medium width accommodates many types of feet, though those with wide feet might feel more snug. The EverTrack outsole layer acts as a shield against wear and abrasion. It’s a durable material that’s placed in crucial areas where wear is more likely to occur. It also provides reliable traction and support like the Wave Creation 20 from Mizuno. The Flex Grooves in the forefoot area offer more freedom when it comes to the movement of the foot, thus making each toe-off more energized and more natural. A Transition Line that runs along the mid-foot to the forefoot area mimics the natural gait pattern when running, thus making each step more fluid and agreeable. The IGNITE foam material is Puma’s trademark mid-sole unit. It’s a responsive component that offers cushioning and energy return, while being durable and flexible. The ForEverFoam tech is placed in the heel area. This high quality foam offers durable cushioning that doesn’t easily break down or lose structural integrity. It can handle the weight of the runner and still retain a high level of strength even after many uses. The breathable mesh upper keeps the foot dry and cool. It has a more open construction than the original Ignite because the overlay system has been placed to the sides of the shoe. The material is also more flexible, making it more responsive to the natural movement of the foot. The Silicon Print at the heel area of the Ignite v2 was created to add more security to the rear section of the foot. It locks the heel down in place, thus keeping the whole foot in the shoe at all times. Reflective detailing is added in this unit, enhancing visibility and overall appeal. The Suede tongue is soft and comfortable to the skin. It doesn’t have too much padding, therefore making the overall fit less snug or restrictive. An overlay system in the sides of this running shoe helps to customize the fit by responding to adjustments made to the lacing system. Mid-foot security is the focus of the overlays.